My destination was Trondheim in Central Norway. 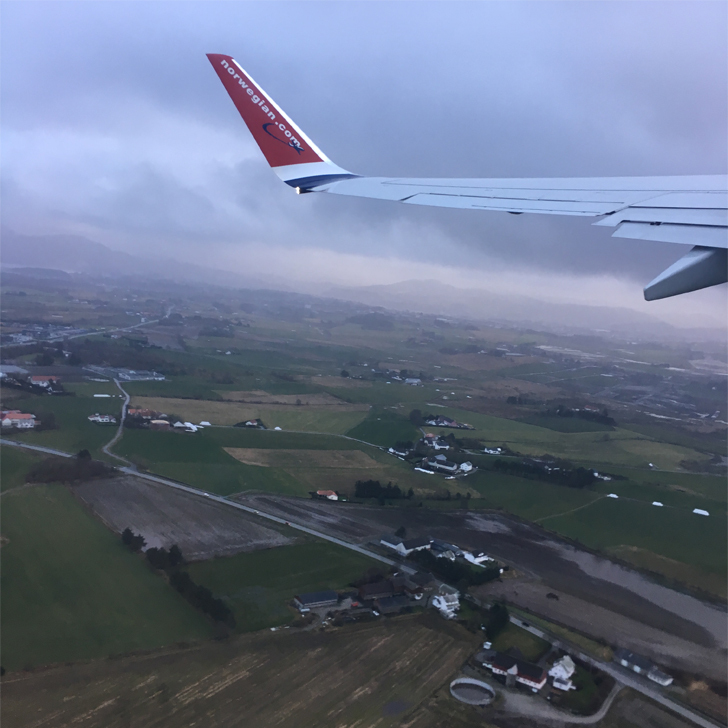 There was a direct flight available from Gatwick Airport, however the flight times weren’t very convenient (it would have meant arriving very late in the evening), so instead I opted for a midday flight to Oslo with Norwegian Air, changing there for my connecting flight to Trondheim. So far so good. The day before I checked in for both parts of my connecting flight (as you have two different aircrafts and presumably two different seats, you will end up with two different boarding passes, meaning you have to ensure you check in for both flights). As I was flying hand luggage only, I did not have to worry about my checked luggage. And I was supposed to have a good hour in-between flights, so timing hopefully shouldn’t be an issue either. And it wasn’t. The flight to Oslo was bang on time. 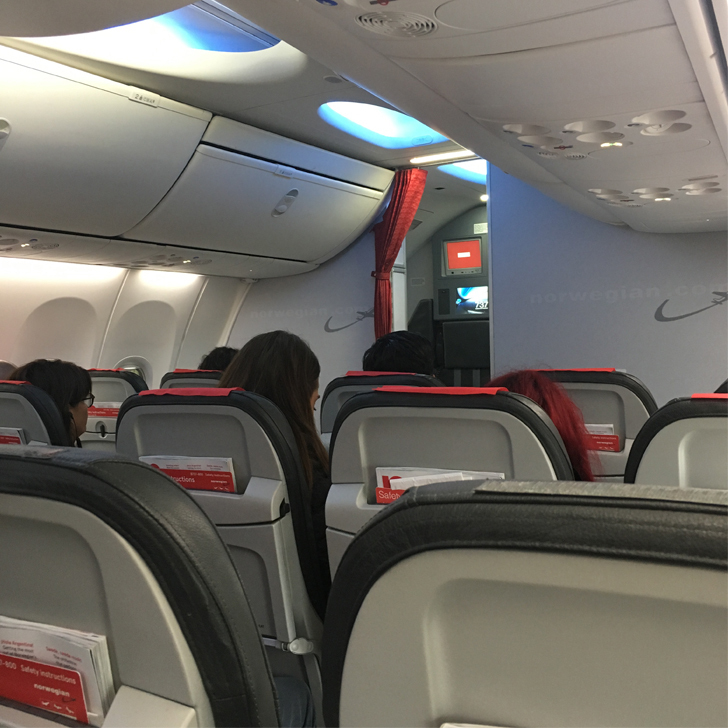 Despite being one of those airlines without free catering (didn’t matter, I came prepared), Norwegian Air makes up for it by offering free Wifi on most of their flights. Giving you the chance to work (or update your social media) whilst airborne. 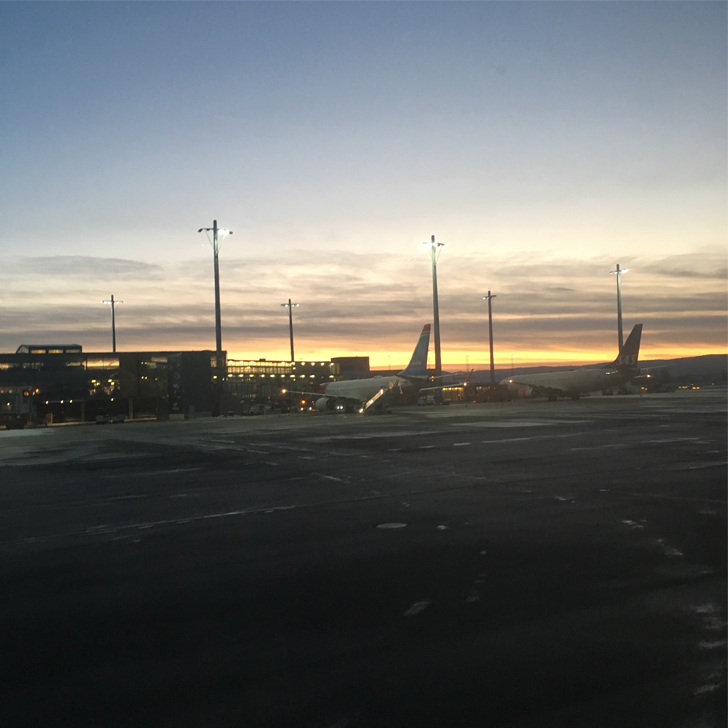 Once landed in Oslo, I disembarked the aircraft and followed the signs for connecting flights, taking me through passport control, same as everyone else. 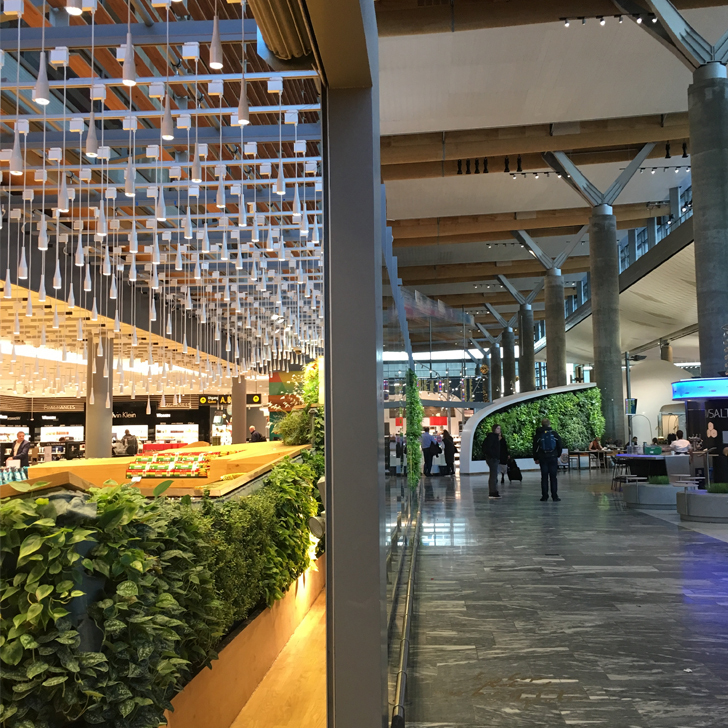 OK but back to flying… I had a quick nose around Oslo airport before making it to my new departure gate. Unfortunately my connecting flight was delayed by around 30 mins before boarding, but Norwegian Air was kind enough to keep me informed via text every time they had an update. Plus a little more delay whilst de-icing the plane. But in the end we managed to make up most of it, so landed only a few minutes behind schedule. But since I did not actually have any meeting that day, it wasn’t a problem. From the airport I took a direct bus into town, which dropped me literally on the doorstep of my hotel. The one thing I really wasn’t prepared for was the cold. 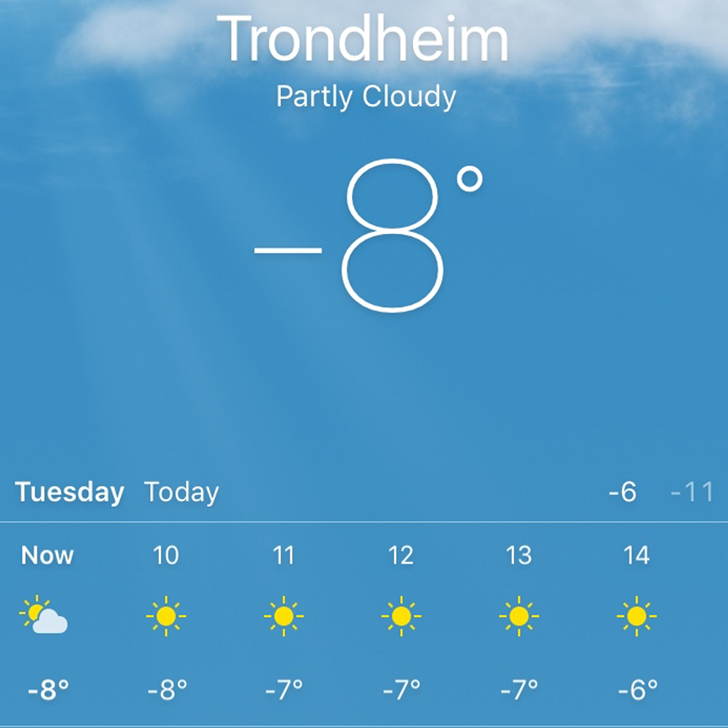 I mean I knew it was going to be cold in Norway, I did check the weather forecast… but living in London where temperatures rarely go below 0, I forgot just how cold minus 8 can feel. Especially if you don’t bring a proper warm winter jacket (guilty as charged) and thin leather gloves. 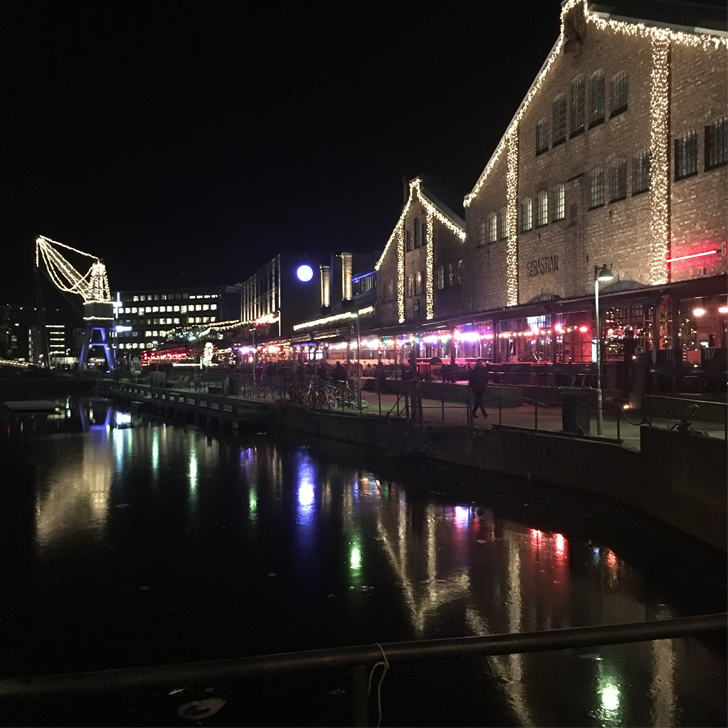 By the time I got to the hotel it was already pitch black… but that didn’t stop me from going for a quick stroll along the harbour (with emphasis on ‘quick’… keep moving, so you won’t freeze to death… and don’t take photos, as this means taking off your gloves). The next day I had my meeting in the morning, then another bus back to the airport (airport busses seem to work well here and you seem to be able to catch them from anywhere… or maybe I was just lucky, I don’t know). 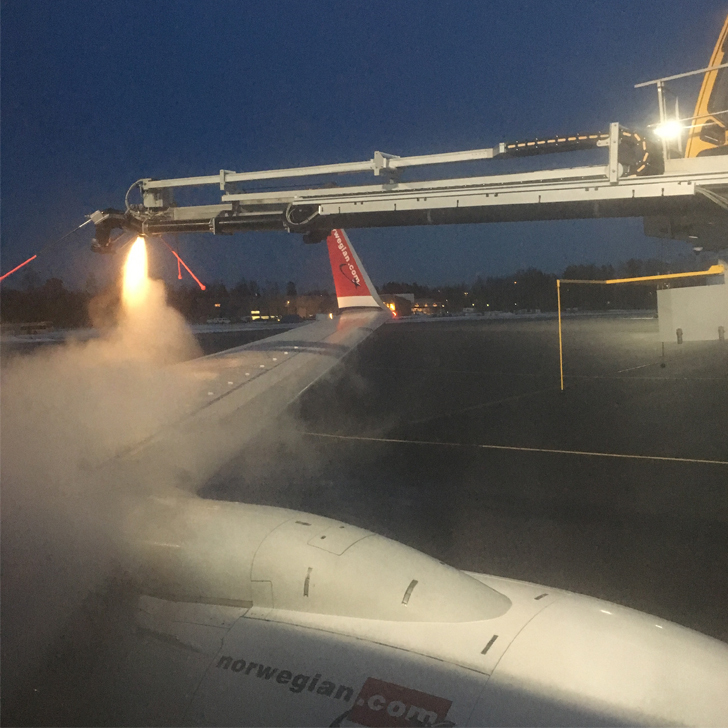 The flight back to London was another connecting flight, but rather than Norwegian Air and via Oslo, this time it was SAS with a connection in Stavanger. Unfortunately the weather in Norway had taken a turn earlier that day with a snow storm hitting the Oslo region. Lucky me, I wasn’t changing in Oslo on the way back, so this shouldn’t effect me… Or so I thought. The flight to Stavanger all went to plan, on time and without any problems. Similar to the day before, I had around 1 hour to change planes, so no need to panic. This time I was prepared… ensuring my water bottle was empty by the time I got off the plane… only to find that in Stavanger I did not need to go through security again. Well… Better safe than sorry. Getting off the plane I was told to immediately go to my gate. 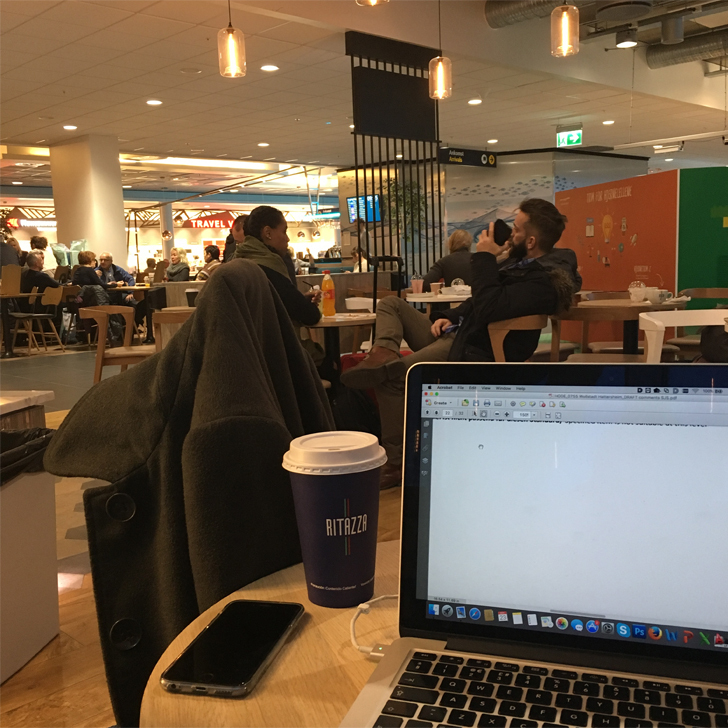 But once I arrived there I noticed that my flight was delayed by around two hours, so out I went again in search for a coffee (and ideally some power for the laptop and phones… you never know how long the wait till be, so best to be prepared). And so the wait began…. Our estimated departure time was pushed back and forth; no one really knew what was happening. Seems that even though I wasn’t flying to Oslo myself, my plane was due to arrive from Oslo… and thanks to the snowstorm it could not start. That was until the unthinkable happened… my flight was CANCELLED. Leaving me stranded half way through my journey (another first by the way – not the cancellation itself, but it happening half way through a journey… so far it’s mainly been when I was near home and could just stay an extra night or was able to just change to a different flights that same day). We were asked to leave airside and go to the SAS desk in the departure area. Unfortunately no one there was really able (or shall I say willing?) to help. Apparently we were all supposed to just sit back and wait until we eventually receive a text message from SAS with info and details about our new itinerary. And once we’ve received that, we were then to report to the desk to get a hotel for the night… oh yes, makes total sense… especially since now (three weeks on), I am still waiting for that text. So eventually I took matters into my own hands, booked myself a flight for the next morning (didn’t quite fancy another ordeal with SAS, so went for a Norwegian Air flight instead) and found myself a hotel (albeit not the convenient one next to the airport, as that was completely reserved by the airlines, for all those poor stranded passengers). By now it was quite late, pouring with rain and pitch dark, so I opted to head straight for the hotel, have dinner there and go straight to bed. So I did not see anything from Stavanger itself unfortunately. The next morning felt a little like groundhog day. I arrived back at the airport well in time, placed myself in the same coffee shop as the evening before and waited for my flight to board. After all the excitement the evening before, I am glad to report that the actual flight back was without any further incidents and I eventually made it back home. And as for Norway, I will be back in January, so hopefully I will be able to see a bit more of the country.